This instrument of 23 stops was installed and completed in time for Easter Day, 2002. The church’s limited ceiling height offered us the greatest design challenge: There was insufficient room in the balcony for the entire organ, and we wanted the instrument to assist the eye in providing height to the room which the architecture did not. 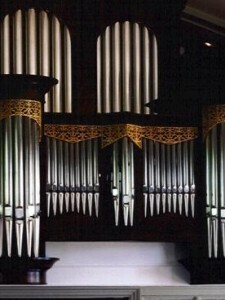 Therefore, the Swell and Pedal Organs are encased on the balcony floor, but the Great Organ is housed in the smaller case overhanging the balcony rail. The cases and console are made of beautiful dark walnut; the pipe shades in the Great case are made of basswood. The façade pipes of the Great and Pedal Principals are made of rather heavy polished 75% tin. The roman mouths, round towers, and pipe shades relate to the arched windows and the barrel vault ceiling. The Tuba is made of polished copper, and is mounted horizontally off the pediment at the top of the Swell case. Since its resonators tend to disappear into the shadows, this somewhat “un-Georgian” feature does not disturb the proportions. 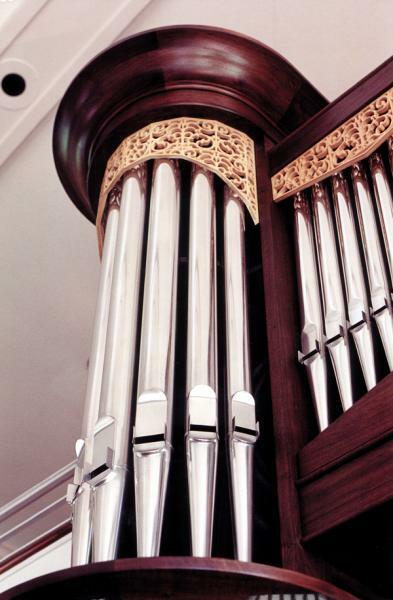 The instrument reflects my tonal aesthetic, in which the organ’s primary responsibility is to accompany singing and be an active and full participant in the Liturgy. To this end, the organ’s tonal forces can be smoothly built up in a seamless crescendo; unison pitched stops of softer volumes are incorporated into the specification to offer a great variety of accompanimental textures; a lyrical cantabile reed on each manual may be used for obbligato playing and coloring of ensembles. The full swell has the necessary “clang” to dramatically color the full organ, but can accompany the choir when the shutters are closed. The Tuba, here voiced on 11 inches of wind, sings smoothly, but commandingly, above the full organ for thrilling rendering of ceremonial music. 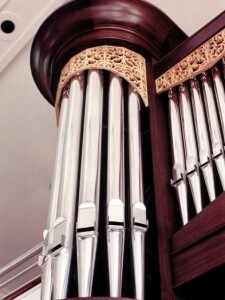 The instrument plays solo organ literature of many styles and periods with an innate musicality and warmth. The choruses are finely balanced within themselves, and between divisions. The chorus reeds color the ensembles, adding just enough fire in this close acoustical environment to spice things up, but not overtake. The mixtures truly reinforce fundamental pitch, and clarify ensembles, rather than confuse them. 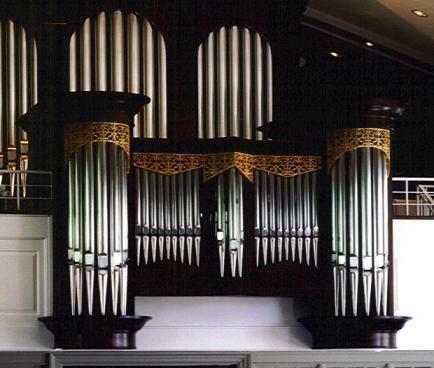 It has been a privilege and honor to design and build this new pipe organ for the people of Saint David’s Church. Special thanks to their Rector, The Rev. Graham Smith, Music Director Victoria Jicha, and the kind parishioners and members of the Organ Committee and Vestry who became captivated by our somewhat unconventional visual design and layout, fell in love with our tonal style, and worked tirelessly to prepare the space for the new instrument.